My novel EBENEZER'S LOCKER finds a publisher! The learning curve never levels out in this business. Here I am, facing yet another new situation, the juggling of books. For the first time, I have three long works at different stages. Ebenezer's Locker was delayed in finding a publisher because of my time-wasting agent search. It now has a contract with MuseItUp, but no release date. My adult sci fi is finished and ready to go, and in December I regain rights to my other middle-grade novel, which was never published despite its contract. My concern is that the novels will bump into each other and make marketing very confusing. But everyone should have such a problem, right? 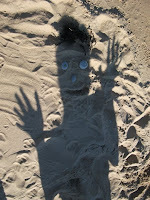 I need to get the sci fi out the door, so it has a chance to cause me a marketing headache! 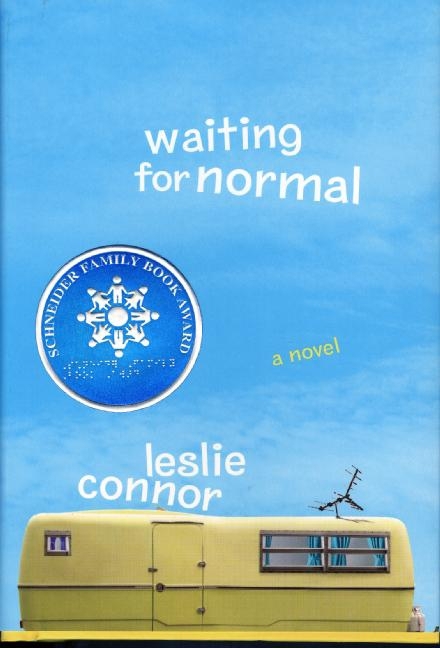 Yesterday I was reading Leslie Connor's remarkable, award-winning middle-grade novel, Waiting for Normal, and I was astonished by its emotional richness and by the author's courage. Connor's impossible feat is to couch her story in a contemporary world of realistic pain, yet make it readable. Waiting for Normal is a wonder to read. That's practically a magic trick, given that the main character is dealing with a neglectful, manic-depressive mom, poverty, her parents' divorce, and the terminal cancer of a friend. That should make you want to slit your wrists, but the writing has such delicacy and such a strong heart that the every triumph over pain fills the reader with joy. Writing intense pain believably, but in a way that a reader can withstand, is an art that few have mastered. The skill is not only appropriate to realistic contemporary settings, but can inform any genre. One could think of it as a compositional style. Lois Lowry's celebrated middle-grade novel, The Giver, is a good example of science fiction inlaid with real heartache. It is much trickier to write about pain for a middle-grade than a YA audience because of the need to protect the younger, less-worldly reader. I'd love to hear about other MG novels that you think succeed as being very painful but very hopeful. Curious to report: Sending out at least a story per week has significantly decreased my rate of acceptances. On the other hand, I've been much more courageous in the kinds of things I'll try to write, so that's very positive, and would explain a lot of the rejections. I'll have to mull over exactly what I've learned over the past few months as I decide whether to increase my sub pace again next summer. Until then, we re-balance, as all healthy creatures must. I always enjoy the funny, imaginative, and unabashedly weird stories of Rhys Hughes, and I'm thrilled to have him as a guest today. 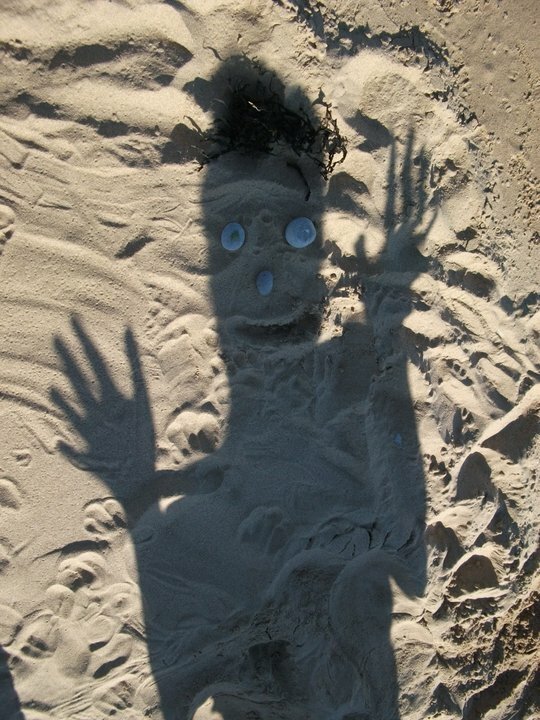 As you can tell from his photo, he's a shadowy character, so who better to discuss the term "magic realism"? Rhys Hughes' new novel, Link Arms With Toads! is available here, and you can also visit his blog. I'm proud to announce that I have a book contract with MuseItUp Publishing for my middle-grade paranormal mystery novel, Ebenezer's Locker. It will be released as an e-book. I look forward to reporting here on the process of publication and marketing. 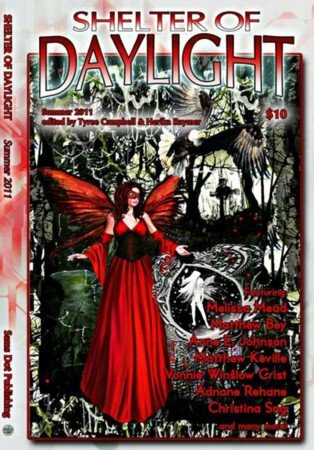 And in other good news, my adult spec-fic story "The Orpheus Factor" is now released in the newest edition of Shelter of Daylight, a Sam's Dot publication that you can order here. It's got a beautiful cover, don't you think?